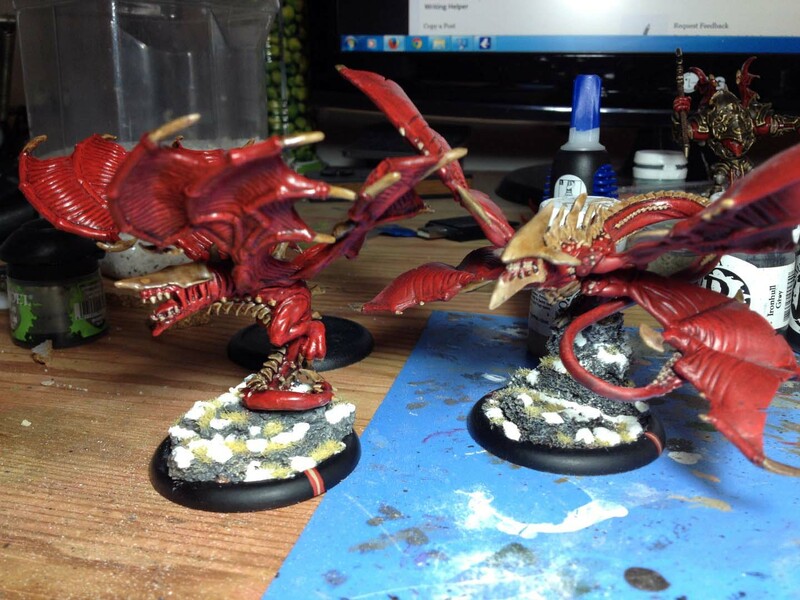 I’ve been painting up a storm. Here is an update of how it’s been going. Double Angelius because why would you ever want just one? Metal Seraph and the new plastic Seraph/Neraph kit. Personally I like the metal one much better. As big and unwieldy as it is, it fits in the foam much easier than the new plastic one. Wings everywhere. Thagrosh2. I love this guy. This model was one of the reasons I was ever interested in Legion. So awesome. He’s not bad on the table either. The mythical Nephilim Bloodseer. It finally came out about a year and a half after the Hordes: Gargantuans book in which it was featured. Was it worth the wait? I don’t know. But this is the best cast plastic model I have seen from Privateer Press and it seems to be made of a new type of stiffer plastic that appears to hold details much better. I also really like the model and his rules so we will see. 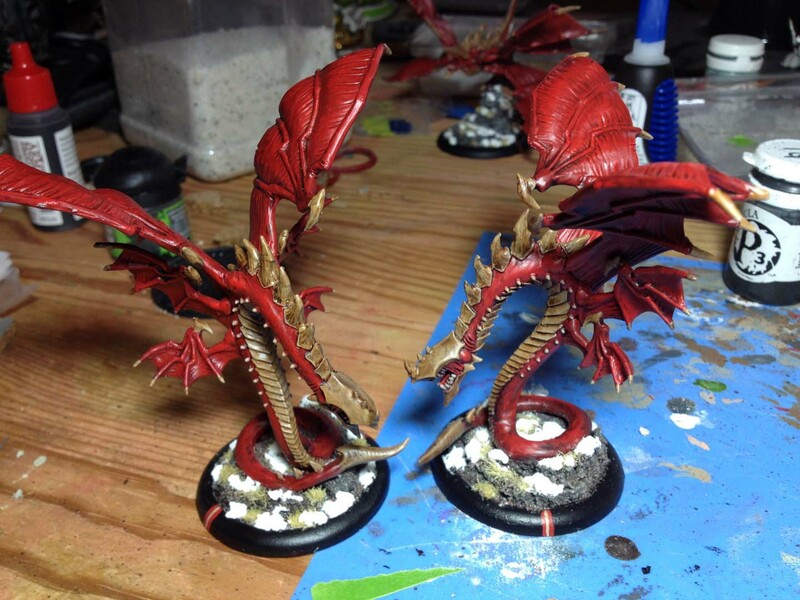 What would a Legion army be with out a separate army of support models for our Beasts. pVayl. I am itching to try out the Vayls. I love their models and they both seem so powerful in such different ways. Finally, Thagrosh1. He has been painted for a while but I finally got around to finishing his base. That’s everything for now. I also have eAbby done but there’s already a post about her. Next up: I am painting eVayl and I will be doing a step-by-step tutorial for how I paint her on request of one of our fans on the Facebook page. 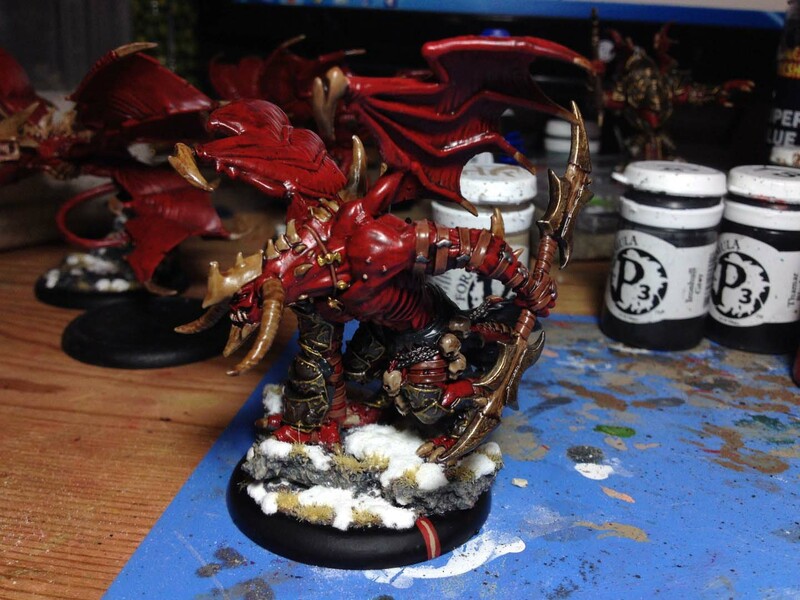 This entry was posted in Painting Table and tagged Bloodseer, Carnivean, Everblight, Forsaken, Hordes, Legion, Naga, Neraph, Raek, Ravagore, Scythean, Seraph, Shepherd, Succubus, Thagrosh, Vayl, WarMachine by Nick. Bookmark the permalink. Lovely painting. I like the colour choice as the bold red really off-sets the pale skin. I look forward to seeing your Lylyth3 if you ever get her; she’ll be more like Father Christmas than ever! In not in a rush to pick her up mostly because all the other Legion casters are soooo much more compelling. Not that she’s bad per se. But test assured whenever I do get around to buying her she WILL have a Santa hat.